Whole House Water Filter Advanced Upgrade has a breakthrough configuration. This is a 2-tank system, plus a pre-filter. This size is right for 2 to 4 person homes under 3,800 square feet, with up to 3 1/2 baths. Media lasts for 5 years or 300,000 gallons (whichever is first) for Chlorine version! 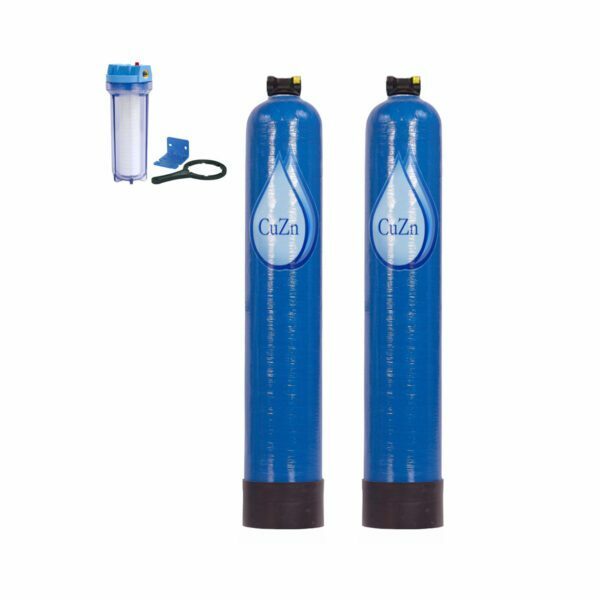 The Whole House Water Filter Advanced Upgrade can be configured for chlorine – or for chloramine. The chloramine version also filters out chlorine so it’s right if your municipality uses chloramine or alternates back and forth. 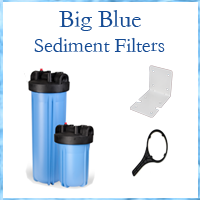 Get the right filter for what is in your water! Look on the web for “(your town + state) Annual Water Quality Report,” or call the number on your water bill and ask them if they use chlorine or chloramine. Or email us with your town and state and we’ll check for you. This is the medium size of an exceptional whole house water filter system. 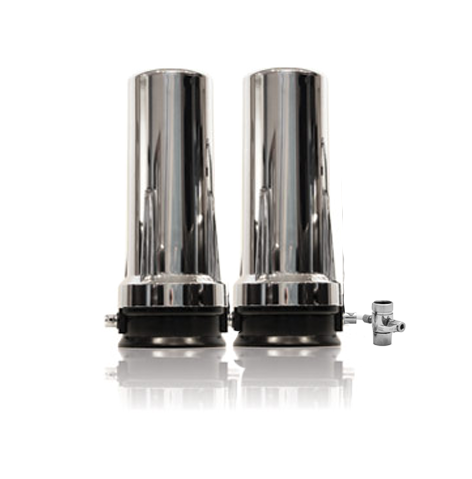 This filter system combines five top filter media that are effective on a wide spectrum of contaminants, including heavy metal, organic, chemical, odor and taste. And it has specialized media targeting pharmaceuticals, herbicides, pesticides, and fluoride. Uses the FOAM ADVANTAGE for kdf, increasing effectiveness and extending media life. For Refills info and links, see Refill tab. To see an FAQ, click on: Frequently Asked Questions. To see certifications of media and tanks, click on Certifications. Email us at [email protected] or call us with questions about whole house water filter systems toll-free at 866-482-6803. If we don’t pick up, leave a message and we’ll be back to you soon. Sometimes we’re just on another line. At the latest, we’ll be back to you the next business morning (Pacific time). 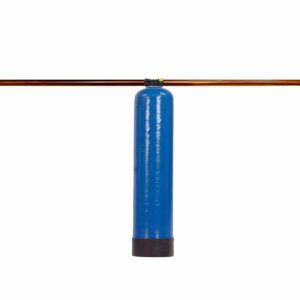 The process begins with a micro sediment pre-filter to remove any physical, undissolved particles out of the water. Although your water looks clear, you will be amazed by how much dirt & grime this filter captures. In the Whole House Water Filter Advanced Upgrade, the main tanks combine a proprietary patent-processed KDF-55 mineral media (copper-zinc), high purity coconut shell carbon, zeolite (clinoptilolite), calcium-based carbon (bone char) & Rx Filtration media, all of which have been tested to NSF standard 42 and 61. 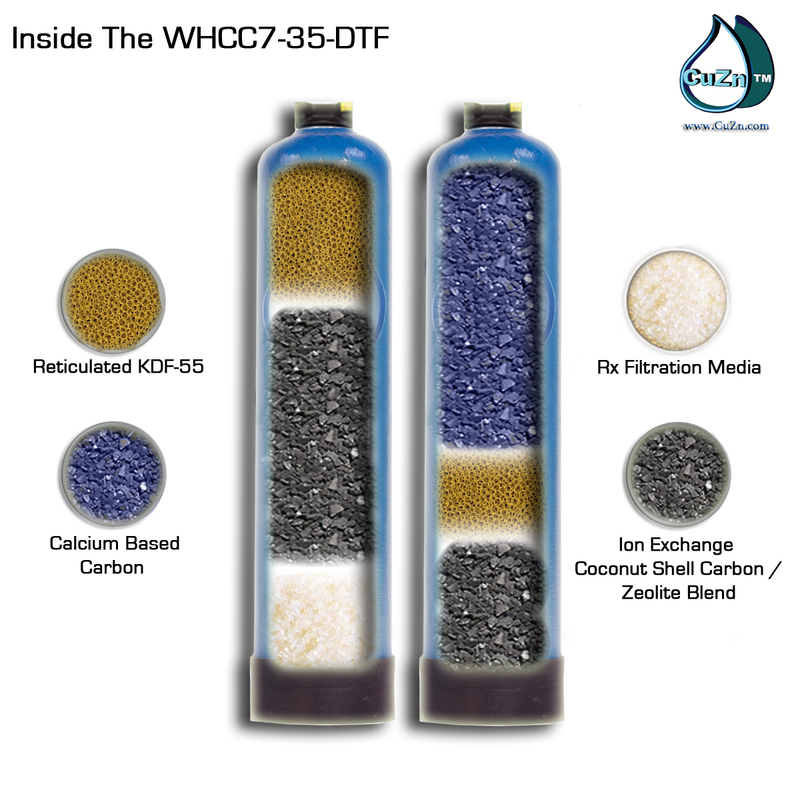 KDF is a great REDOX (oxidation/reduction) filter media. It delivers a unique natural process of electrochemical oxidation/reduction and adsorption. KDF-55 targets the dissolved inorganic contaminants. It filters up to 98% of soluble cation heavy metals including mercury, lead, chromium, cadmium, etc. Powerful KDF-55 redox media creates a bacteriostatic environment that prevents the growth of bacteria, mold & other microbial contaminants. The KDF in this filter has been processed using the FOAM ADVANTAGE patent, which means you get more filtration from less media. SNRF Ion Exchange Coconut Shell Carbon is an adsorbent media that target the volatile organic compounds (chlorine, THMs, disinfection by products, herbicides, pesticides, etc). This carbon is supercharged with an internal modification for ion exchange properties. This delivers soluble lead adsorption (Ion Exchange Capacity is 130mg/g). The heavy metal reduction capability is additive, given that FOAM ADVANTAGE KDF-55 is also incorporated in to the system design. Together they assure 99% removal of soluble lead, even at high flow rates. The Calcium Based Carbon (BRIMAC), also known as Bone Char, has a unique porous matrix of ions created by heating a raw material in an oxygen rich vessel at 1,292 °F. The result is a unique type of Calcium-Based Activated Carbon with properties that are very different than the more common Coconut Shell Activated Carbon. While coconut shell carbon is great for organic contaminants, it is not effective for inorganic contaminants. However, Calcium-Based Carbon is selective for filtering inorganic contaminants. Fluoride filtration is the most common application for Calcium-Based Carbon. It is also used in applications for radionuclides reduction including radium, uranium & arsenic present at levels below the MCL. Fluoride is one of the more slowly-adsorbed contaminants. Lower water flow permits more fluoride filtration. A large quantity of high-quality fluoride-filtering media is required for whole house reduction of this contaminant. 90+% removal of fluoride (as you get with other contaminants) is not generally feasible for Whole House Water Filtration Applications. However, this stage of the dual tank system will reduce exposure to fluoride significantly. 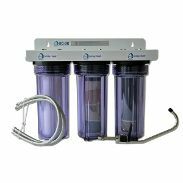 If you want to remove more fluoride than is possible at the whole house level, we can do so with a 2-canister kitchen filter. The biggest risks of fluoride are from ingestion. Zeolite Filtration Media is a great filtration material with both adsorbent & ion exchange properties. The most prominent application for Zeolite is ammonia removal. Zeolite compliments activated carbon’s adsorption of volatile organic compounds. Zeolite tends to offer greater efficacy with the removal of some organics that activated carbon is less effective adsorbing. It also has shown promise for the removal of various radionuclides with its unique ion exchange properties. Rx Filtration Media is a mesoporous (nano-level) organosilica media that possesses a flexible and hydrophobic pore structure. Rx media is able to remove nearly all forms of pharmaceutical contamination found in potable water supplies. Testing shows 99% removal of antidepressants, antibiotics, birth controls & 75% removal anti-inflammatory drugs and antihistamines). Rx media can also be used for the extraction of organic species, including hydrocarbons, all forms of oil, chlorinated solvents, esters & glycols. Capacity: 300,000 gallons for chlorine! 150,000 gallons for chloramine. Pressure Loss: Less than 1 psi ! Installation instructions are sent with the unit. It is basic plumbing to cut the filters into the water line, and create a bypass line. It takes some hours, but it’s not complicated.